Despite spectacular advances, modern medicine faces formidable global challenges in several key areas—notably the persistence of major killer diseases such as malaria, tuberculosis, leprosy, and newer threats including HIV/AIDS, resistant infections, and Ebola. As such, modern medicine has not led to a significant decrease in chronic diseases like diabetes, obesity, and other degenerative and autoimmune diseases. The authors believe that modern medicine needs to experience a paradigm shift, an integration of traditions—in particular from the ancient systems like Ayurveda and Yoga. 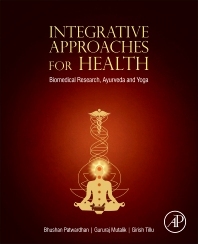 Integrative Approaches for Health: Biomedical Research, Ayurveda and Yoga brings together the basic principles of interdisciplinary systems approach for an evolving construct of future medicine. Such an approach is already emerging at the cutting edge of current research in omics, bioinformatics, computational and systems biology. Several leading institutions of medicine have adopted Yoga and complementary medicine to widen their reach, and deepen effectiveness in therapeutic practices. The amalgam of modern medicine, with its strengths in scientific rigor, blended with the basic principles of life drawn from Ayurveda and Yoga might evolve into a medicine of tomorrow. Integrative approaches are no longer alternative, perhaps taking these approaches is the only possible way to heal our sick planet. This book introduces important trends and tools for biomedical researchers and physicians alike, to innovate the practice of medicine for the better. Contains a harmonious confluence of ancient and modern concepts, historical perspectives, philosophical underpinnings, and a relevant review of literature supported by worldwide case studies. Provides a critical analysis of ancient wisdom, pointing to potential areas for future research, which provide food for thought for public debate on integrative health care for the twenty-first century. Explains Ayurveda knowledge, and its relevance to drug discovery, nutrition, genomics, epigenetics, regenerative biology, longevity and personalized medicine. Shares Yoga knowledge insights, and explains its relevance to body–mind complex relationships, psychology, neurobiology, immunoendocrinology, bioenergetics, consciousness, and cognitive sciences. Offers illustrations and logic diagrams for enhanced understanding of the concepts presented. Bhushan Patwardhan, PhD, received his degrees in biochemistry. He is a professor and the Director of the Interdisciplinary School of Health Sciences, Savitribai Phule Pune University, India, where he is engaged in research in biomedical sciences, pharmaceutical biology, and evidence-based Ayurveda. He is a Fellow of the National Academy of Medical Sciences (India), the recipient of many prestigious orations, and founder and Editor in Chief of the Journal of Ayurveda and Integrative Medicine. He is the author of over one hundred scientific papers, holds eight international patents, and has received four thousand citations. His research on drug discovery and genomics has received high acclaim. Gururaj Mutalik, MD, received formal education in modern medicine is a distinguished physician with basic knowledge of Ayurveda, who has witnessed transformations in clinical medicine for about six decades. He was Professor of Medicine, and Dean at Byramjee Jeejeebhoy Medical College, Pune, India. He worked as a post-doctoral fellow in human genetics at Johns Hopkins University School of Medicine. He served as the Director of the WHO at the United Nations in the New York City. He was Chief Executive Officer of International Physicians for the Prevention of Nuclear War, a Boston-based, international organization of physicians, which received Nobel Peace Prize in 1985. Presently, he is engaged in research in Indian knowledge systems. Girish Tillu, MD, is trained in Ayurvedic medicine, and is pursuing research at the Interdisciplinary School of Health Sciences, Savitribai Phule University of Pune, India. He worked as a scientist at the Center for Development of Advanced Computing, Pune and was instrumental in the development of the innovative software suite, AyuSoft, which is a decision-support system based on logic, and knowledge base of Ayurveda. He is involved in the study of Ayurveda and Yoga through interdisciplinary approaches comprising epidemiology, clinical pharmacology, and informatics. He is a recipient of the Vaidya Scientist Fellowship.